Increasingly, people are using lavender in creative ways to promote relaxation. It is popular to use in nebulizers, sprays, salts, and scrubs to calm the body and promote sleep. Creative cooks are using it increasingly in cooking as well. Lavender tea is a simple start to that end. Lavender tea is surprisingly pleasant. For my lavender tea recipe, you can use fresh or dried lavender flowers, something we actually keep in our pantry that we have dried from our own property. I mix and match the lavender flowers with other herbs in my kitchen stash. You can use lavender alone. The flavor is good but I prefer a lighter base to my tea and typically use a lemon balm, another one of my favorite soothing herbs. You can also try it in your favorite teas — cat nip or chamomile would work nicely if you are looking for a soothing companion herb in your lavender tea. Add honey to taste. Serve. This lavender tea is pleasant any time of the day but it is particularly nice as a night time ritual since it does promote relaxation. There are many varieties of lavender and they do have some wonderfully and subtly different fragrances and flavors. My rule of thumb: Use the lavender you have. We have several English lavenders, the most commonly used culinary lavenders. They make great teas. 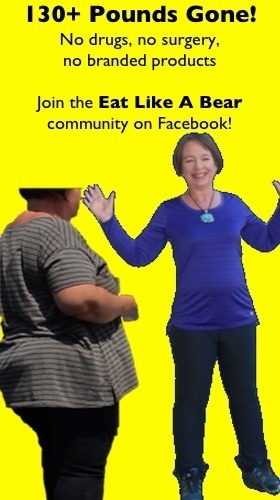 If you have another that you are wondering about, I would simply try it and see how you like it. All lavenders are edible and, as a result, are safe for your tea. Enjoy! 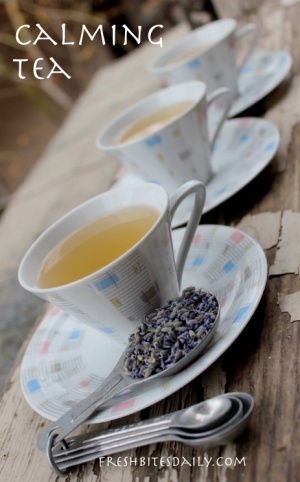 This is a simple lavender tea to help soothe your soul. Pour boiling water over lemon balm and lavender. 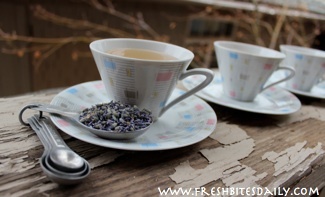 5 Comments on "Lavender tea – You may feel calm just looking at this picture"
I’ve always love lavender as an ingredient. It gives a different kind of relaxed feeling. Lavender tea would surely be great as well. I like lavender flower because it has many benefits. The flower also has good aroma and can be used to prevent the mosquito attack. I live in tropical are. In the rain season usually the mosquito proliferation is very quick. This tea looks lovely. I’ve had lavender in my garden for a couple of years but haven’t used it yet. I’ll have to try the tea and learn to use this herb! I enjoyed your article today & found you through Frugally Sustainable’s blog hop! I’ve been drinking Lavender tea in the evenings to help me sleep and love it with honey.